The Third Man had its London premiere on 2 September 1949, going on general release the following month. In the intervening weeks the film was shown in competition at the Cannes film festival , where it won the Palme d'or , the festival's top prize. The American release was delayed by various contractual wrangles until February 1950. The Third Man was a huge box-office success both in Europe and America, a success that reflected great critical acclamation. 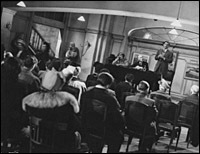 British cinema flourished after the end of World War II ( Laurence Olivier 's Hamlet (1948), for example, had won the Best Picture Academy Award in 1949), and Reed 's reputation was particularly formidable. The legendary French critic André Bazin was echoing widespread views when, in October 1949, he wrote of The Third Man 's director: "Carol Reed... definitively proves himself to be the most brilliant of English directors and one of the foremost in the world." The positive critical reaction extended to all parts of the press, from popular daily newspapers to specialist film magazines, from niche consumer publications to the broadsheet establishment papers. The mass-market Daily Mirror (2 September 1949) ran the headline: "Pardon Me if I Rave!" Its critic Reg Whitley enthused: "At last, here's a film we can really rave about!... Produced and directed Carol Reed, the film combines superb artistry with 100 per cent. entertainment value... a magnificent piece screencraft!" A local paper, the Cambridge Daily News (25 October 1949), agreed that the film was both artistic and effective for a mass audience: "Don't be misled by any high-falutin' ideas you might have conjured-up about Mr. Reed. Certainly he is a director who believes in the cinema as a medium of artistic expression... but at the same time he has not missed the beat of the public's pulse." The same theme was taken up in The Mail (2 September 1949): "What is the secret of this man [Reed], who has the approval of the highbrows... and still gives the ninepennies a storming entertainment?" The London Standard (1 September 1949) summed up the general view: "Once again Carol Reed, our finest director, has hit the jackpot..."
In the mass-market Woman (5 November 1949), Freda Bruce Lockhart trilled that "it will hold you spellbound from beginning to end". Vogue (October 1949), also overwhelmingly aimed at a female readership, stated that the film "justifies all hopes... a dazzling effort". Its unnamed reviewer proved to be both an en eloquent and an incisive reviewer: "Over it all spreads the melancholy, inert beauty of a ruined city, passive on the surface, twitching with uneasy life underneath, always waiting for something to happen." More male-oriented publications were soberer in their tone, but similarly full of praise. In the political weekly The New Statesman (10 September 1949) William Whitebait wrote: "The worst that could be said of The Third Man is that at its weakest moment it is a thriller that enormously thrills." 'Abacus', in the stiff-necked Schoolmaster (27 October 1949), declared The Third Man "a film we can proudly bequeath to critics of 1999." "Probably American filmgoers' best of 1950" (Time) "Carol Reed is a picture Titan of genius. This is pioneer potography and story-telling" (New York Daily Mirror) "Profoundly satisfying" ( New York Post ) "A stunning production" (New York Daily News). Dissenting voices were very rare, but there were some. The British communist paper The Daily Worker (3 September 1949), for instance, lamented that "no effort is spared to make the Soviet authorities as sinister and unsympathetic as possible". In the specialist film press reviews were of course more analytic but still prone to fulsome praise. "Camera work on an exceptionally high plane, and in his painstaking direction Carol Reed lives up to his high reputation" (Variety, 7 September 1949). "Stylistically, The Third Man is Reed's most impressive film," wrote 'G. L.' (probably the now-eminent writer Gavin Lambert ) in the Monthly Film Bulletin (30 September 1949). Ferncz Gunczy spoke of "an unforgettable film achievement" in Films in Review (March 1950). It's interesting, however, that the critics who most qualified their admiration for The Third Man were also some of the most eminent. Among them were Britain's two most notable female critics. Dilys Powell wrote in The Sunday Times: "It is, I suppose, because Reed's exceptional talent leads one to expect miracles that I feel a shade of disappointment at the reappearance of the familiar trick and the familiar situation" (4 September 1949). C. A. Lejeune used a similar phrase: "Mr. Reed has never before elaborated his style so desperately, nor used so many tricks in the presentation of a film" (The Observer, 4 September 1949). "It is just a bang-up melodrama, designed to excite and entertain.... Mr. Reed has brilliantly packaged the whole bag of his cinematic tricks" (New York Times, 3 February 1950). Graham Greene's script compared with his original novella. The story behind Anton Karas' famous zither score.